The Character Animation Editor is an editor window opened through the inspector view of a CharAnimationController. 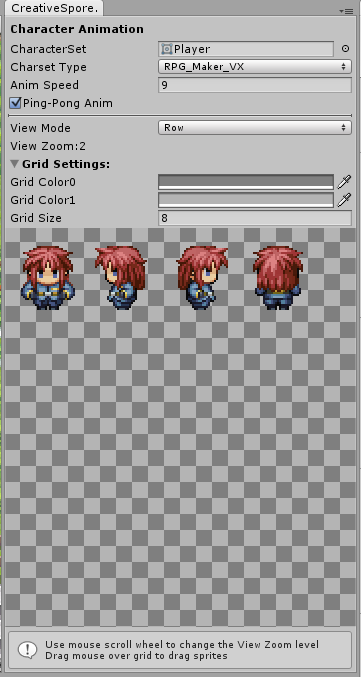 You will be able to edit and create the character animation using an Editor Window to make it easy to change parameters like animation speed or the sprite pivot and create enemies, NPCs or the player faster and easier. If you change the SpriteCharSet remember to change also the Charset Type to the right type of charset. 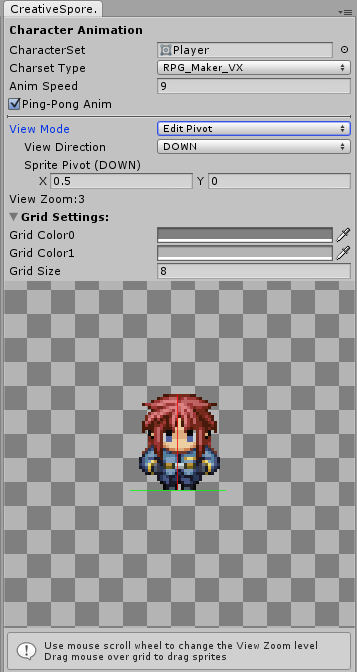 The Target Sprite Renderer will be the Sprite Renderer where the animation will be rendered. Anim Speed is the speed of the animation in frames per second. Ping-Pong Anim change the order of animation frames. There are always 3 frames per walking animation: frame 0, 1 & 2. If Ping-Pong is activated, the animation will be like 0,1,2,1,0 in a loop. Otherwise it will be 0,1,2,0,1,2. Some animations are thought to be played in ping-pong, some are not. Facing Dir will change the character facing direction. You can changed most of the parameters here, in the inspector window, but if you want to access more advanced parameters, you can access the Character Animation Window by pressing the Open Editor… button. 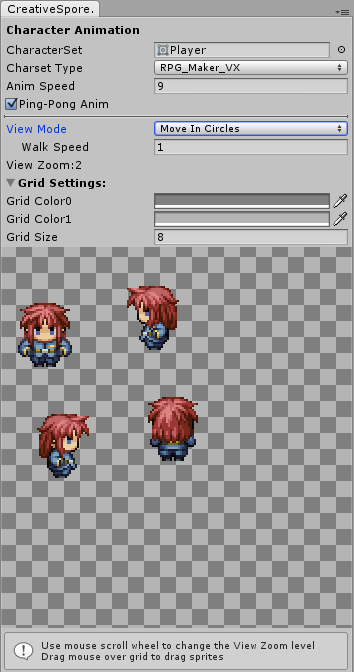 Here, you can change the View Mode to see the character animated in different configurations. One of the view modes, Edit Pivot, allow you to change the pivot of the character for each direction. Most of the cases are good using the default pivot (0.5, 0) but in some cases it’s useful to change the pivot. 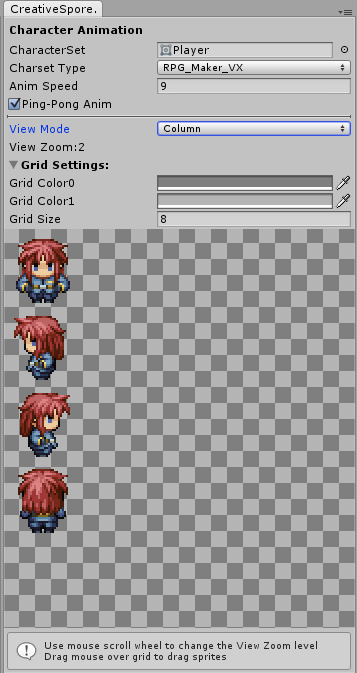 You can change the grid options as well and drag the mouse over the grid to move the character and use the mouse wheel to zoom in and out. Posted on 11 July, 2015 11 July, 2015 Categories Sin categoría4 Comments on Creativespore web reborn!